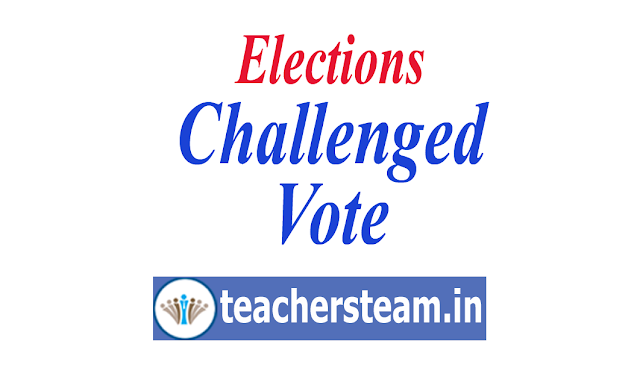 The polling agent can also challenge the identity of a person claiming to be a particular elector by depositing a sum of Rupees 2 in cash with you for each such challenge. You shall hold a summary inquiry into the challenge. If after the enquiry you consider that the challenge has not been established, you shall allow the person challenged to vote. If you consider that the challenge has been established, you shall debar the person challenged from voting and shall handover such person to the police with a written complaint. Immediately after the inquiry is over, return the challenge fee of two rupees to the person, who made the challenge, after taking his receipt in Column 10 of Form 14 – “LIST OF CHALLENGED VOTES” and on the counterfoil of the relevant receipt in the receipt book, in every case, except where you are of the opinion that the challenge was frivolous or was not made in good faith. In the latter case, forfeit the challenge fee to Government and do not return it to the challenger and enter the word “forfeited” in Column 10 of Form 14 and the relevant counterfoil in the receipt book, instead of taking the depositor’s signature or thumb impression.